PAMP is pleased to announce the latest edition in its popular Lunar Calendar Series: the Year 2016 of the Monkey ingot. For centuries, the monkey has held a place of great prominence in Chinese culture, and is widely celebrated for its fearless, quick-witted and optimistic nature. According to the Chinese, the Year of the Monkey is believed to bring about a time of great progress, innovation and financial prosperity. Each PAMP Suisse Lunar Monkey Silver Bar contains 10 grams of 999.9 Fine Silver, the new ingot features a striking and innovative design effect that portrays the monkey front-to-back – a hallmark of the PAMP Lunar Calendar Series. Each bar bears a unique serial number as well. 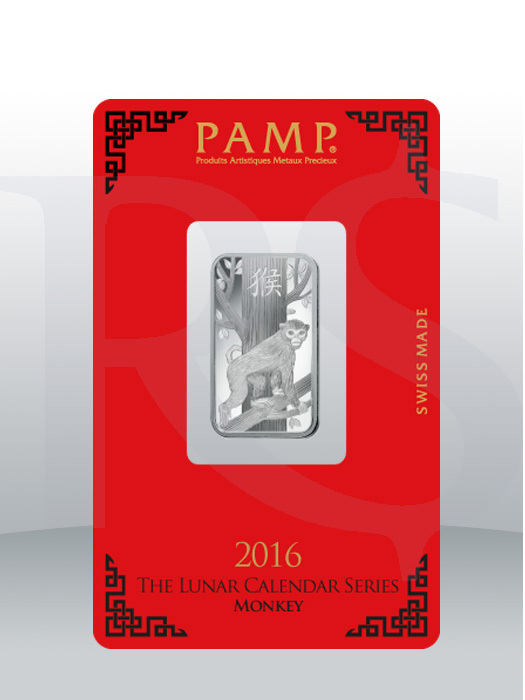 The Year of the Monkey is the fifth edition in PAMP's Lunar Calendar Series, joining the Dragon, Snake, Horse and Goat. As with every edition of the Lunar Calendar Series, the Year of the Monkey ingot is sealed within brilliant red CertiPAMP packaging, ensuring that it is both ready-made for gift-giving and an ideal purchase for bullion enthusiasts. 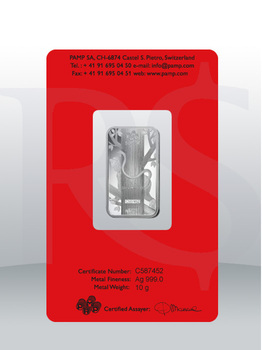 The PAMP Suisse Lunar Monkey 10 grams Silver Bar measures 31mm x 18mm with thickness of 1.81mm.